Watch the GuruJam Pre-jam Party and Contest Live!!! Todd Carter, Guillotine during todays practise session, you can tune in later today!! 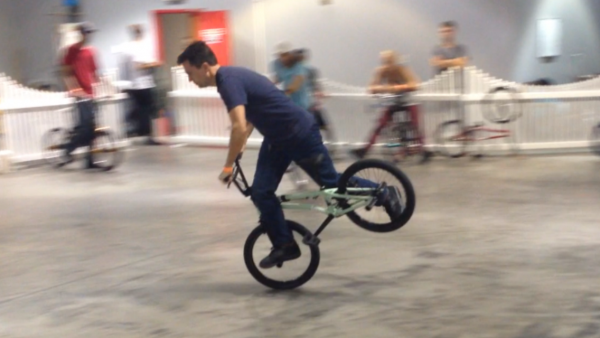 It’s a huge weekend for flatland this weekend! One of the biggest of the year with Guru jam and the World Circuit finals in Kobe, Japan both going down! The Guru jam is going down live tonight from 18:00EST and all day Saturday starting at 10:00 EST. When I get word of the World Circuit livestream I’ll post it up for you all. Hold tight! This entry was posted in News and tagged Watch the GuruJam Pre-jam Party and Contest Live!!! by Effraim. Bookmark the permalink. Two big contests in the same weekend! what about flat ark? no news at all? Haven’t seen too much yet and i’ve been looking, posting qualifying results in a moment Erik. Pretty busy with the guru jam, we will be going live in an hour or so, then later on World Circuit finals will be on. Enjoy! Thank you for the photo! Stoked on this contest! awesome…. got the computer set at my riding spot watching while taken breaks…. just came back from work.. is it allready started the live stream? thanks for the comment enjoy gurujam!